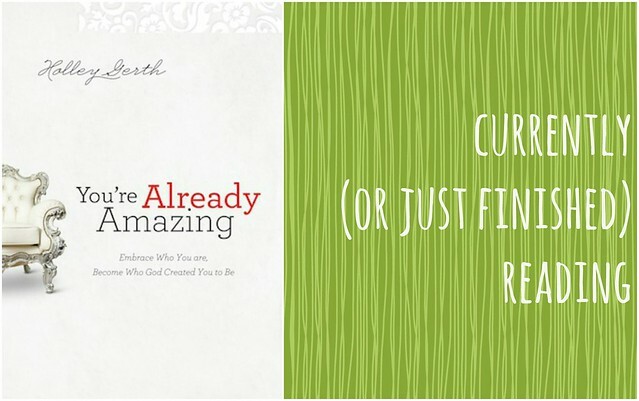 currently reading: you're already amazing. After reading all of Megan's posts, I knew I had to get my hands on one of Holley Gerth's books. Unfortunately, my strict-budget-self couldn't get her hands on that particular book without paying for it. Fortunately, my local library had one of Holley's other books, You're Already Amazing. And I'm pretty sure I decided to read it because the title came with a free compliment. Anyway, the line under the title reads, "Embracing who you are, becoming all God created you to be." Words I think are perfect for my college grad, unemployed, and kind of lost self. And if I'm honest, I think they're words we all need to hear, regardless of where we are in life. I for one have found myself doubting my abilities and potential lately. I have dreams but find myself making up excuses not to pursue them in fear of rejection or failure. And while I know these insecurities are clouding up my vision and motivation to move, I've found myself clinging to them nonetheless. in me you are much more." "The road He's [God] carved out for you is yours alone. you're the only one who is ever going to walk it." That really hit home. As in really. Comparing is a waste of time and energy, friends. Holley reminded me that God doesn't call us to compare He created us all differently for a reason. Fortunately, our God can take these insecurities and hard times in life and turn them into something better. God will do so--and His idea of perfect is entirely different than ours. Let's just say reading that excerpt kind of blew my mind. It made me realize that society's definition of perfection is nothing compared to God's definition. God's definition is about journeying, not clear skin or expensive shoes. It's about making progress, not money. It's about finishing what He's called us to do, not what others tell us to do. And if you're in a state of waiting like me (really multiple times of waiting, if I'm honest! ), Holley has just the right words to encourage and strengthen your hearts. and we need to rest up" for it all. Comforting, right? I think, that in a way, Holley is also telling us to enjoy the moment we've been given because changes are ahead. And God has given us all these different times in our lives for a reason. They may not be our reasons, but they're there for a reason and a good one at that. And while I could write on and on and include all of my favorite parts of her book, that would take pages because it would be the entire book. And then I would have to deal with some sort of copyright issue of sort for writing out her entire book. So to prevent that kind of mess, I just want to encourage all of you to pick up one of Holley's books or just check out her blog (that's right, she's a blogger!). She is full of encouragement, honesty, and love. Like true love, not just cheesy love that's written because she wants to be nice. She is nice and I think you'll agree. In fact, one of the things I love most about Holley is that she truly believes in friendship and community. And the power of using our stories to reach out and tell others more about Him. that what I write is just as much for my healing as it is for yours."